Formulated to be hypoallergenic and developed specifically for tattoo aftercare, the tattoo cream hydrates and favours the restructuration of the skin barrier. It soothes irritations linked with tattooing. Tested under dermatological control, it offers an excellent skin tolerance. Does not stick or stain. Is formulated to be ; allergen-free, paraben-free and without any Phenoxyethanol (glycol ether) or MITs* (Methylchloroisothiazolinone, Methylisothia¬zolinone). *Ingredients banned by the EU for non-rinsed products since July 2015. Allows an increase of 62% in hydration levels of the superior layers of the skin after the first hour of application. (Study realised by the Dermatological Institute Idea). Has an important restructuring action (after 3 days use) allowing for fast healing of the tattooed area. (Study realized by Biological Research Centre Bio-ec). Has an important ability of restructuring the skin barrier in 3 hours. (Study realized by Biological Research Centre Bio-ec). Is conditioned in an Airless bottle (50ml and 100ml), an unbreakable airtight system. Prevents oxidization and guarantees the purity of the formula until its last use. Product complies with legislation dispositions of 2013. 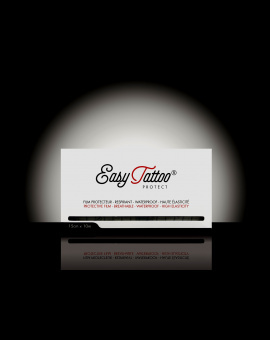 Start by washing your hands with the Easytattoo® soft cleansing gel, rinse thoroughly with clean water and wipe carefully by dabbing with a clean cloth. 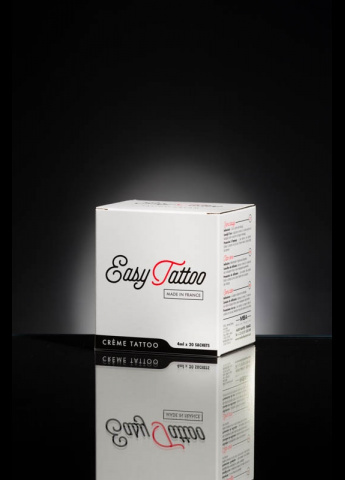 Apply the tattoo cream on the clean and dry tattoo, massage gently. Repeat this process several times a day to maintain hydration. The Panthenol is a vitamin B5 component indispensable for our organism, associated with TGO (oxidized corn oil) also found in the Easytattoo® Cream, it favours restructuration of the skin barrier and soothes irritated skin. It is not by applying a large amount of cream that you will get optimum results. It is the massaging action that will encourage penetration of the cream and thus good restructuring of the skin barrier.